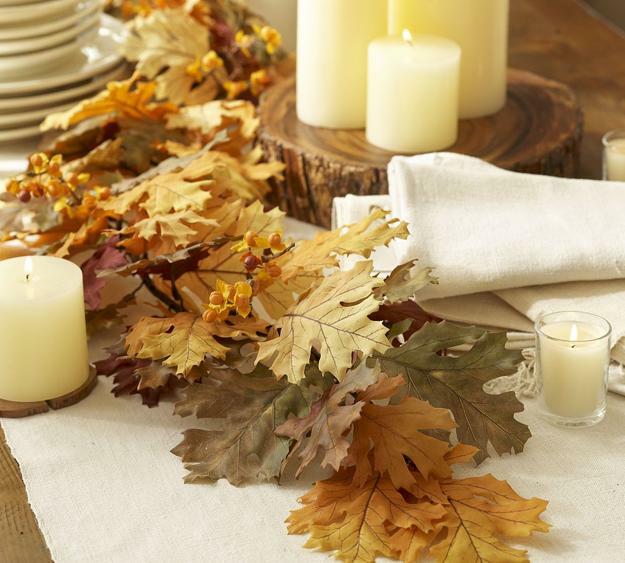 Candle centerpieces combined with fall leaves make bright, beautiful table decorations in fall. 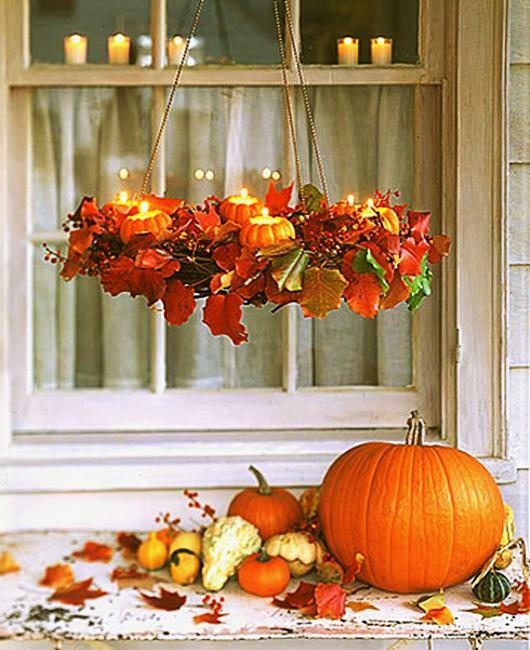 Orange silk ribbons, colorful autumn leaves, and the soft glow of candles centerpieces beautify Thanksgiving decorating and create a peaceful, warm, and relaxing atmosphere for the fall holiday. 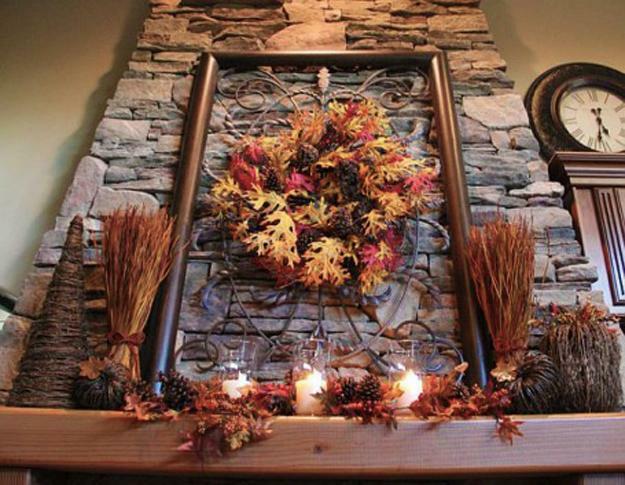 Thanksgiving decorating with fall leaves and candles offer numerous elegant, stylish, and spectacular designs. 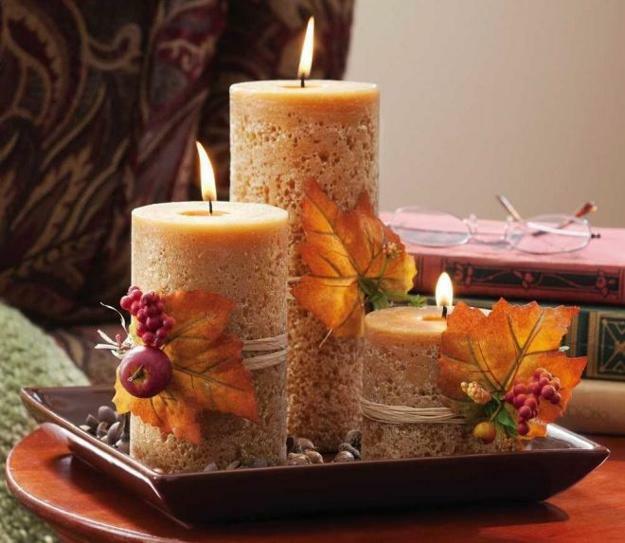 Autumn leaves are complementing the warmth of a candle centerpiece and turn ordinary materials into magic table decorations for Thanksgiving. 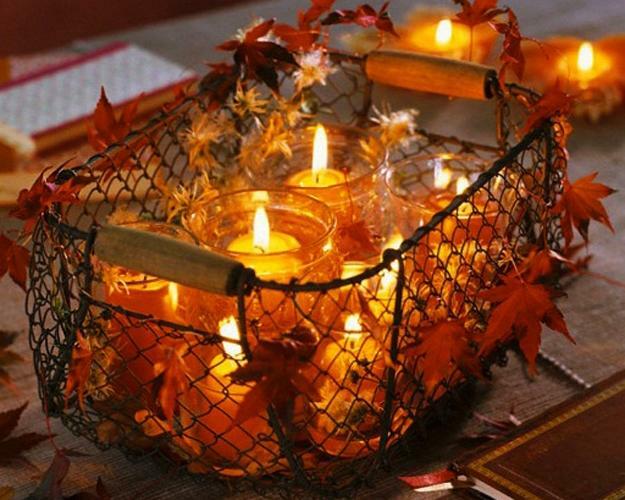 Candle centerpiece designs with autumn leaves are romantic and beautiful. If you like to add a bit of shine and sparkle to your table decoration, you can arrange the candle centerpiece on a polished metal plate or a mirrored tray. Then watch how it enhances your Thanksgiving decorating. 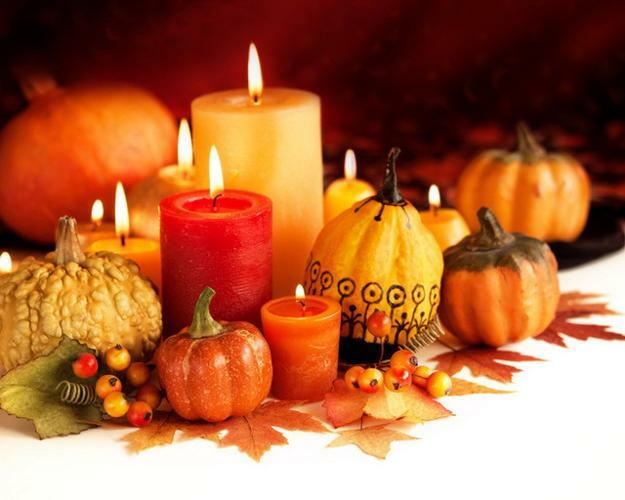 Add nuts, pinecones, small guards, seasonal fruits, and vegetables for your candle centerpiece. 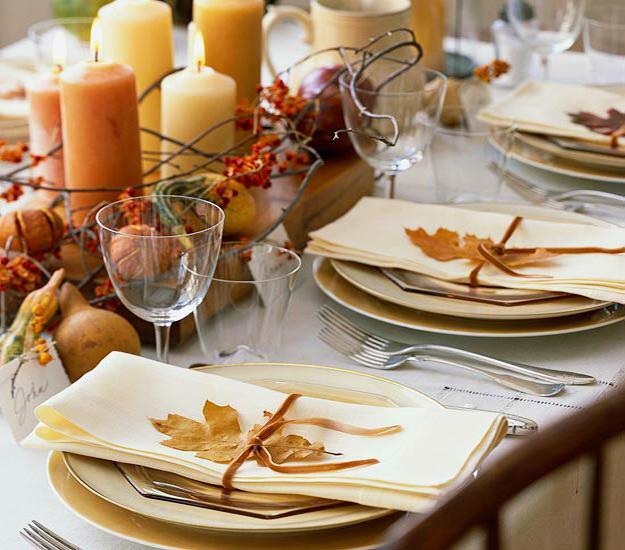 Enjoy a natural feel and splendid beauty of your eco-friendly Thanksgiving table decoration. 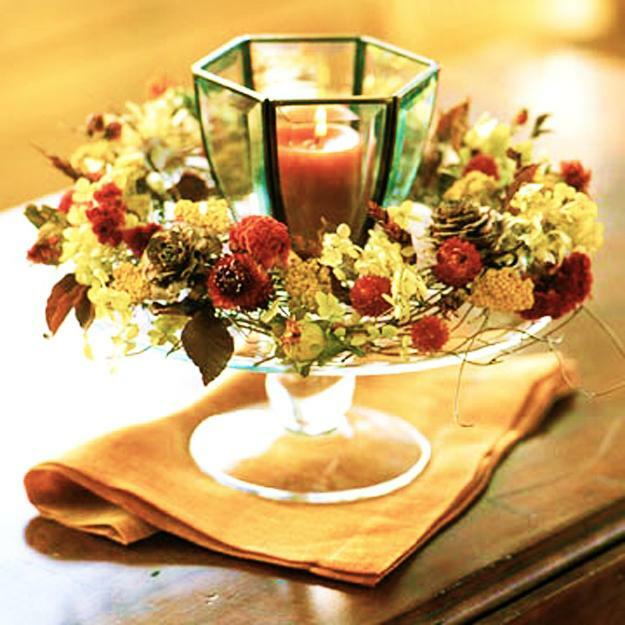 Fall leaves and candle centerpiece ideas are perfect for any Thanksgiving decorating theme. 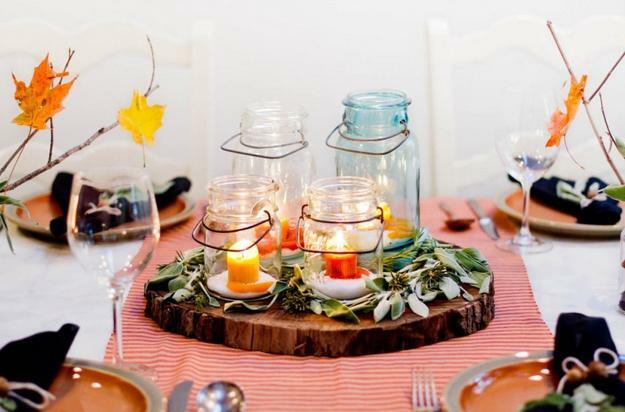 Draw creative designs on glass jars or pumpkins, use sisal twines, burlap pieces, bring berries or tree branches to enhance the eco-style Thanksgiving decorating. 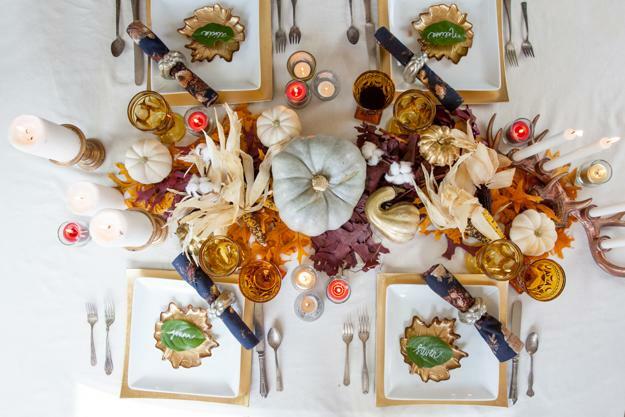 The vibrant fall colors of leaves, fruits, and vegetables create beautiful color combinations that celebrate the harvest theme and look festive with candles on your fall party table. 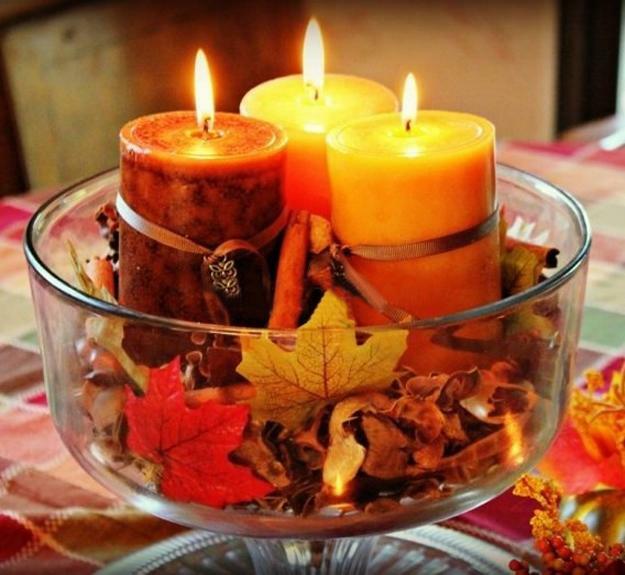 A candle centerpiece surrounded by autumn leaves and placed right at the middle of the Thanksgiving table would look impressive and bright. 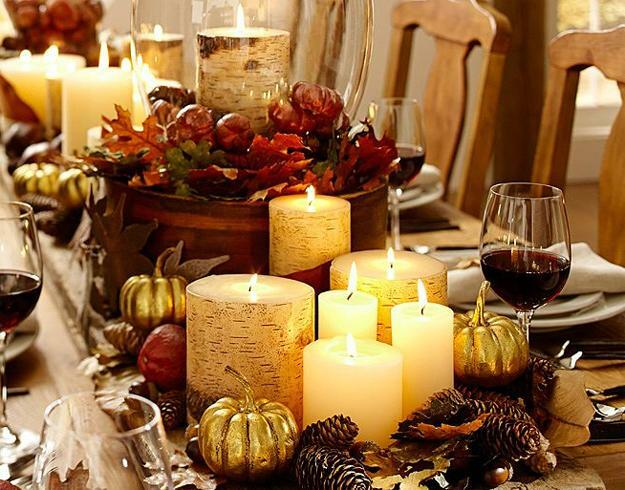 You can make the table decoration look elegant and rich by adding a few branches, guards or pine cones. 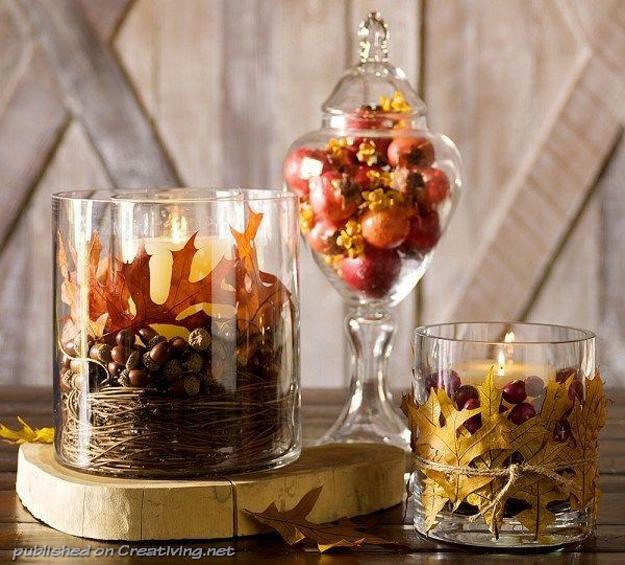 And with this delightful, rich, and natural Thanksgiving table decorations, your dining room would feel warm and cozy. 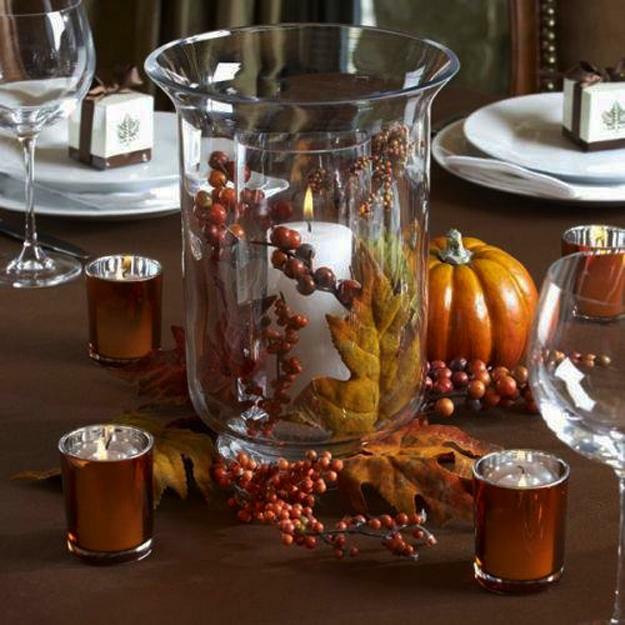 The seasonal accents give a feel of the occasion to Thanksgiving decorating and table setting. 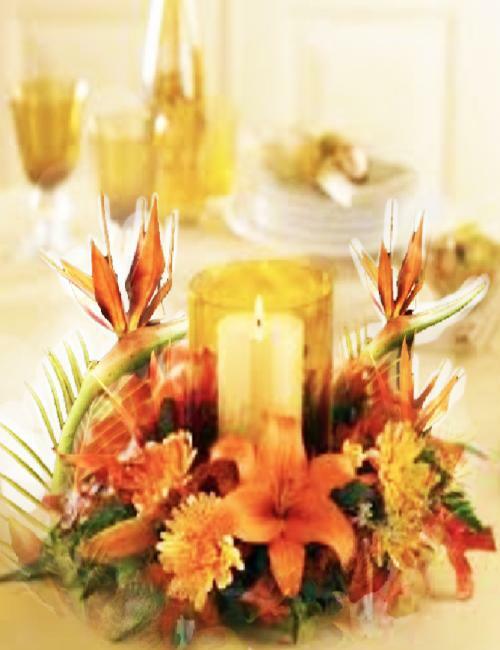 The brown, the rust, the golden colors of fall leaves and glowing in the dark candles centerpieces spell warmth and beauty. 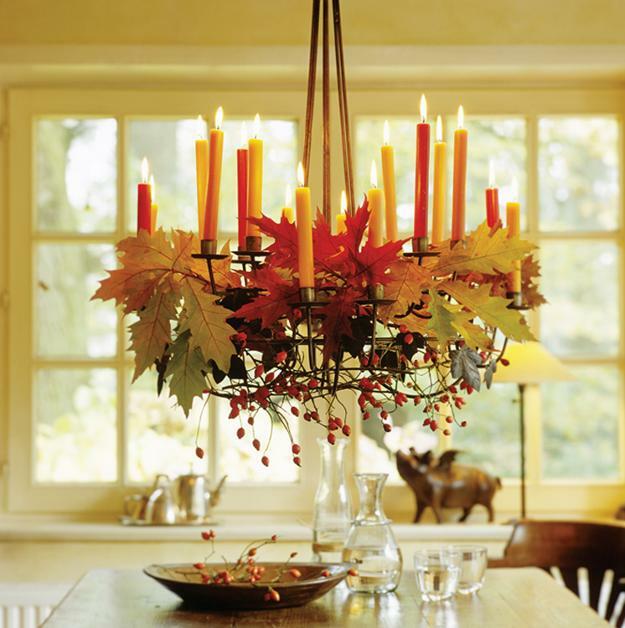 You can spread autumn leaves around the holiday table and decorate each candle centerpiece with them or designs a pendant wreath with autumn leaves and branches and hang it above the holiday table. 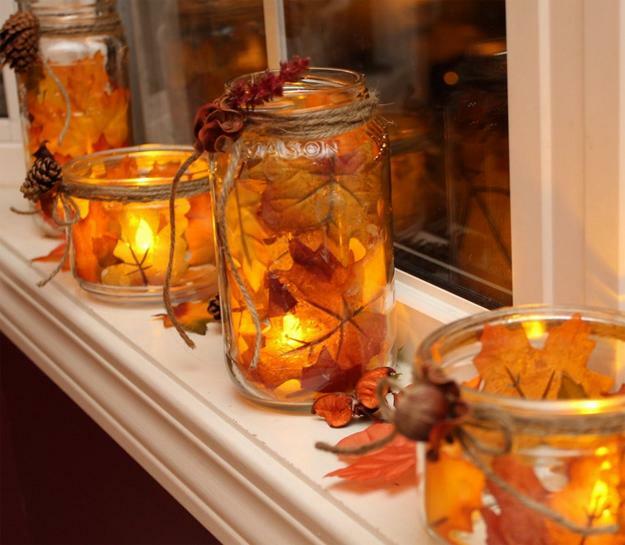 Scented candles, guards, fall leaves, tree branches, fruits, and vegetables are gorgeous ideas for Thanksgiving decorating. 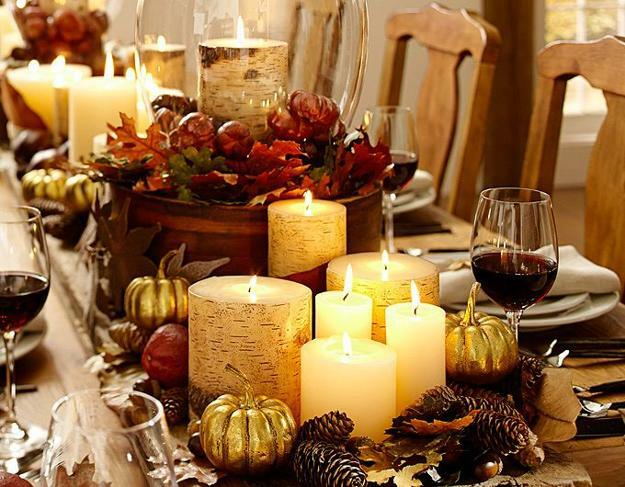 Fall decorations, candle centerpiece ideas, and seasonal accents are galore when it comes to this beautiful holiday of Thanksgiving. 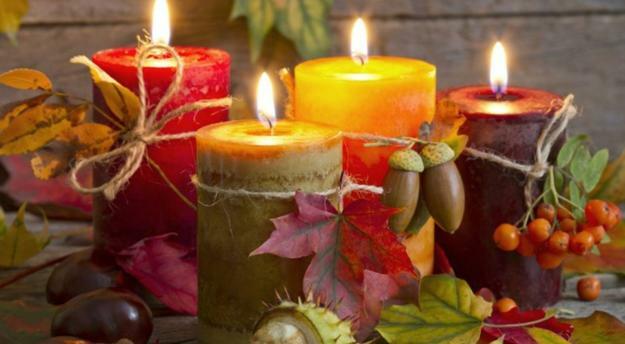 Any combination of natural materials with candles makes perfect Thanksgiving decorations for the holiday tables when you are creative. 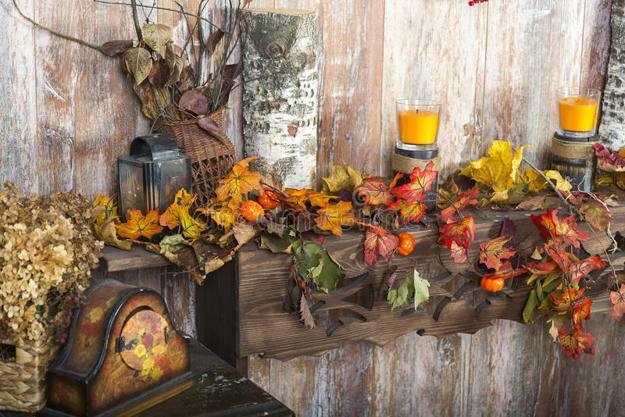 Dry autumn leaves, twigs, sticks, branches with berries look good indoors if the originality and the eco-style fall decor ideas come together.